Lebkuchen are a highly spiced German cookie often associated with the holidays. They’re often very regional and can variously contain fruits, nuts, alcohol, and spices; but are almost always made with honey. They’re like a combination gingerbread and fruit cake: highly spiced, better with age, and something your grandmother loves to eat. This ‘kuchen recipe comes from the 1914 edition of The Neighborhood Cook Book; what I found intriguing was the use of cocoa, which I had never seen before. In the end result, the cocoa doesn’t produce a chocolate flavor, but mellows the intensity of the rest of the spices. The recipe below will make about 100 small cookies which will taste better if left for two weeks in a sealed container before consumption. Everyone loves eating food that’s been sitting around for two weeks, right? From The Neighborhood Cook Book Compiled by the Council Of Jewish Women, 1914. 1. Preheat oven to 350°. Adjust rack to middle position. Line 8-inch square baking pan with parchment paper, allowing paper to extend over sides. 2. Whisk together flour, cocoa, baking powder, cinnamon, cloves, allspice and salt. 3. Using a heatproof, glass measuring cup, heat honey in microwave at 50% power for 1 minute. Pour into bowl of electric mixer. 4. Beat in brown sugar until well combined. Beat in eggs, one at a time. Scrape down bowl. 5. Stir in ½ of the flour mixture and almonds just until combined. Do not over mix. Stir in the rest of flour mixture. 6. Wrap dough in plastic wrap and chill overnight. 7. Work with one quarter of the dough at a time. Return unused portion to refrigerator. With buttered hands pat dough into parchment lined baking pan (a floured spatula or the bottom of a drinking glass can help level the dough). 8. Bake at 350° for 20 minutes, rotating pan once, until no indentation remains when touched. 9. Allow lebkuchen to cool one minute in pan. Lift the lebkuchen out of the pan using the overhanging parchment. Carefully peel parchment off of the bottom of the lebkuchen. Using a thin bladed, sharp knife, trim ¼ inch off all four sides of the lebkuchen. 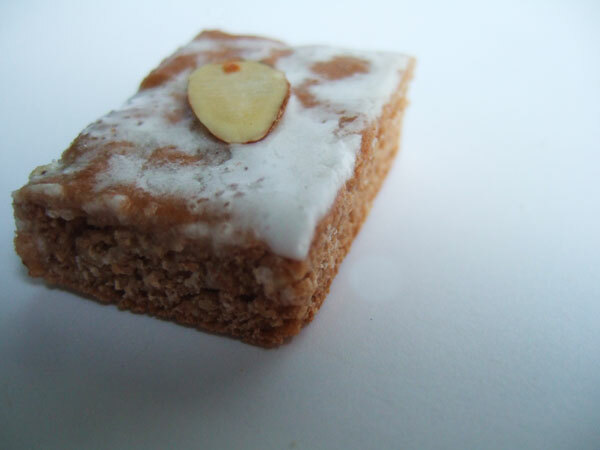 Cut the lebkuchen into twenty-five 1½ inch by 1½ inch bars. Brush with sugar glaze; top with almond slice while glaze is still warm. Mix 1 cup granulated sugar and ½ cup water in a small saucepan. Allow mixture to come to boil over medium heat. Cover saucepan for 2 minutes to allow steam to wash sugar crystals from sides of pan. Remove lid and continue to cook until the syrup reaches 230° on a candy thermometer. Remove from heat and transfer to a heatproof, glass measuring cup. Brush cookies with glaze. If glaze recrystallizes after brushing cookies, reheat one minute on high in microwave, adding ½ tsp. of water, if necessary.